Speed Humps are good for locations where very low speeds are desired and reasonable, and noise and fumes are not a major concern.Special cat eye, the reflective effect is the same the diamond grade reflective sheeting film. Speed Bumps are grooved for drainage of the rain water. 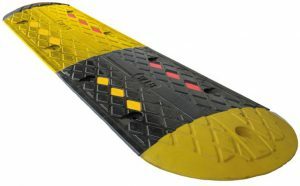 Skid Resistant base helps it making better grip on the road. Instant installation with application of epoxy & spikes for anchoring. No need for painting again & again due to Pre-coloured material. Available in Black and Yellow combination for greater visibility. Speed Bumps & Ramp are ideal for installation in the city area, private colonies, hospitals, schools. other campusses, security check posts, parking areas, loading areas etc.